© 2014, R.L. Delight, "Red Flag Morning", 6"x8", oil on canvas panel. SOLD! Thank you! I painted yesterday after work but I didn't feel the progress was worth posting for Day 3. Today, Day 4, is a different story. 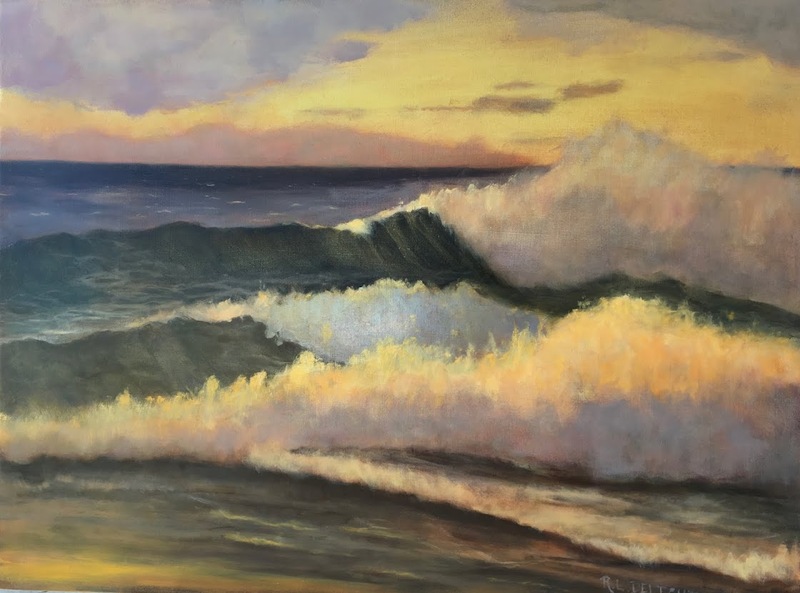 The weather conditions here can change so fast that I have signed up for email alerts and warnings so that I can be informed when I am planning my day, a shopping trip up the coast, or a day painting on the beach for example. Last night a red flag warning popped up. The red flag warning indicated a dramatic shift in the weather that creates extreme fire conditions and increases problems for existing fires. That all translates into a hot dry wind. This morning was incredibly clear and golden so I went out to paint on the beach that fronts our little town. I went, of course, to my favorite wave painting spot at the foot of Neahkahnie mountain. Sure enough, there was a warm offshore wind from the southeast blowing the waves around. The spindrift was flying off the waves as the wind pushed them around, and the morning sun was hitting the face of the waves. The ocean colors were breathtaking. I sat for about 20 minutes watching the waves with my sketchbook in hand until I formed an idea of what I wanted to paint. The wind was so erratic I filled my tripod bag with rocks and hung it from the tripod center to keep it from being blown over. It worked but I had to hold onto my paint brushes as the wind tried to send them flying. When I started painting the wind was mainly from the southeast and smelled hot and dry. It would come blowing a wall of sand and I would have to duck and hold onto my hat in spite of a tightened chin strap. There is a bit of sand from the northern Oregon coast included free of charge in this painting! One of the hazards of plein air painting that I hadn't considered before presented itself today. There are often dead birds and other sea life on the beach. It is sad but part of the cycle of life. I had carefully placed myself upwind of a dead pelican, where I also couldn't see it. Unfortunately, the wind shifted around to the north and I would get the occasional odor of death wafting over me now and then. I toughed it out but would have to occasionally cover my nose with my arm when it got too bad. 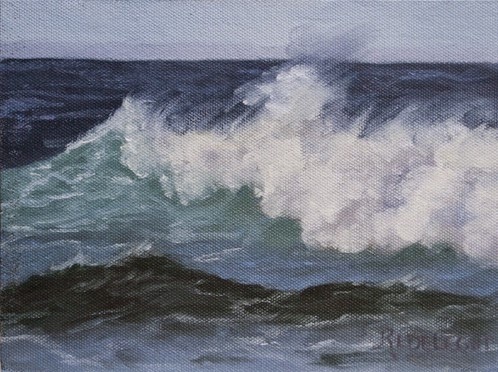 It was a beautiful day today and I am glad I got to paint the morning waves. Tomorrow I hope to head to Short Sands in the morning. With apologies to Theresa, here is her comment. I accidently hit the delete instead of publish. I had actually published it and went to delete the email and hit the wrong delete. Of course blogger would not let me do a redo!